Rock Island County is committed to providing its citizens and website visitors with easier access to information via online services. Below are current online services listed by department. Please email the Web Administrator with any problems, suggestions or comments and thank you for using Rock Island County's online services! Report your lost pet to the Rock Island County Animal Care & Control Shelter. View adoptable pets at the Rock Island County Animal Care & Control Shelter via the PetFinder.com website. Search property assessment information by township-parcel, address-zip code, or PIN number. Tax rates and codes listed by township. Contact information for each township assessor. A reference page that lists the various case codes and a breakdown of their acronyms. Links to various pdf documents such as notices, summons, petitions, orders, and affidavits. The Circuit Clerk's Office continues to add various forms as they are web-enabled. Each pdf document will open in a new window. The Rock Island Circuit Clerk's Office offers two (2) different online payment systems. E-Pay for "NO APPEARANCE Required" traffic tickets, and GPS for assessed fines and costs after a court hearing or to pay the annual Clerks fee for child support. Both payment methods are offered via outside links and will open in a new window. A link to JUDICI.com to search for court records maintained by the Circuit Clerk's Office. According to statute, not all court data is publicly available. Common examples of non-public data include juvenile and adoption cases, as well as any case impounded by the court. This free, internet-based legal self-help center will provide information about your legal problem. 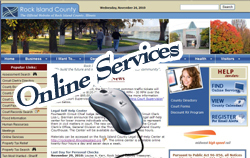 If you do not have a computer connected to the internet, the Rock Island County Legal Self-Help Center is located in the Rock Island County Courthouse in Rock Island. Our Circuit Clerk staff will show you how to use the legal self-help center to find the information you need. Provides the most recent election results. The Elections Calendar for the Rock Island County Clerk's Office. Check the schedule of the Motor Voter Trolley for the upcoming Election. Provides links to various pdf documents. Each pdf document will open in a new window. Agendas and Minutes for the County Board and various committees. If you're tired of checking up on your favorite web pages just to see if they've changed since the last time you visited them, why not let Rock Island County do the checking for you? We'll send you an email notification alert whenever your subscribed page is updated. Sign up to receive email alert notifications. The current year meeting schedules for the County Board and other committees. The new GIS Parcel Viewer is now available. Email Casey Kremer or Josh Boudi with additional data requests. Health Alerts and Press Releases issued by the Rock Island County Health Department.